How can I avoid getting derailed by unexpected calls, fire drills, or family emergencies? I’m constantly getting pulled into meetings; how can I get anything done? My squeaky wheel clients always want the oil. How can I ensure they don’t take time away from my other clients without them getting upset? At their core, these questions are really asking the same thing: How can I stop other people and external circumstances from derailing my productivity? Too often, it feels like we’re being pushed and pulled in different directions rather than choosing the path to take. In order to preserve our time (and our sanity!) it’s important to not only manage your expectations, but to also manage the expectations of others. A wise literary agent, Barbara Poelle, once told me, “You teach people how you want to be treated.” When you accept every meeting request regardless of what’s convenient for you, you teach your co-workers that their convenience is more important than your needs. When a client calls with a not-so-urgent request that has no looming deadline, but you drop everything you’re doing to jump on it right away because “it will just take a second” or you think that delaying the request will upset them, you teach your client that it’s okay to demand anything on a minute’s notice. When you agree to phone calls, coffees, and “brain picking” sessions with anyone who asks, you teach people that your time is not valuable. It may seem like our bosses, our co-workers, or our clients are the ones derailing our productivity, but more often than not, we’re the ones who allowed it to happen in the first place. My wife is a controller at a Fortune 500 company, AKA a very demanding, fancy-pants job. She works extremely hard, puts in well over 50 hours a week (much more during the quarter-close), and manages a large team of people. But she leaves every day by 4:45pm to pick up our son from school. No exceptions. She will log back on at night if there’s more work to be done, but at 4:45pm on the dot, she is out the door. She set up that expectation when our son started school and despite the growing demands and importance of her job, it has never been a problem. What boundaries or expectations do YOU need to establish to become more productive? Never scheduled meetings or calls before a certain time or on a certain day so you could dedicate that time to deep work, a passion project, or time with your family? Only responded to email once or twice a day so you could spend more time on client work? Charged your consulting fee anytime someone asked to grab coffee and pick your brain? Were completely unreachable on weekends? It’s easy to blame our over-working, stress, and burnout on others. We can point to our high-maintenance clients, demanding bosses, and needy colleagues and blame them for our lack of productivity. But it’s really not their fault. If you want boundaries, then it is up to you to establish reasonable and consistent expectations. How have you taught the people in your life how to treat you? 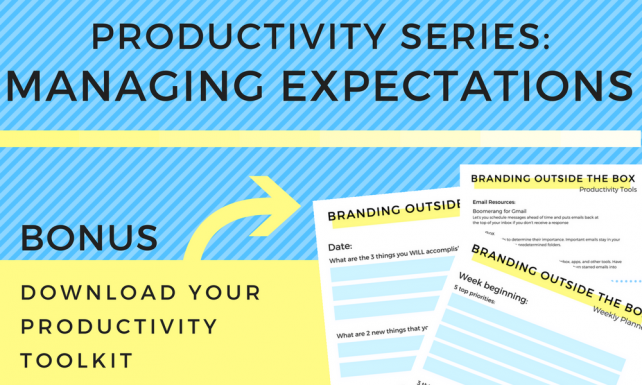 Share your thoughts in the comments and don’t forget to download your FREE productivity toolkit!